How much responsibility do we have for the choices of others? How much can we blame others’ choices for the problems in our own lives? 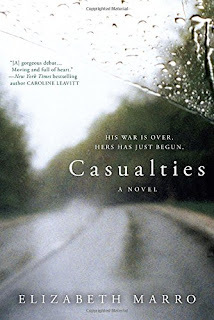 In Elizabeth Marro’s complex debut novel, Casualties, war is the backdrop and impetus of the main characters’ issues. But dig a little deeper. Sometimes the damage was done way before the first bullet was fired. Ruth Nolan is a high-powered executive for a California-based military contractor, responsible for recruiting and supplying non-military bodies to drive the trucks, repair the infrastructure and fix the plumbing in a war zone. So she knows exactly what her troubled son, Robbie, is getting into when he joins the Marines. After two tours in Iraq, he seems none the worse for wear. But when Ruth is pre-occupied with a company scandal – her contractors are not receiving the health and life insurance benefits they had signed up for – Robbie commits suicide. Shattered – and out of a job due to the scandal – Ruth hits the road with no plan in mind. When she gets drunk and attacked at a seedy casino, Desert Storm veteran Casey rescues her. Casey is broke and missing a leg due to his service. Ruth has a car and wants to be anywhere but California. She decides to accompany Casey on his road trip to New Jersey, where Casey hopes to reconnect with the daughter he abandoned years ago. Can Ruth and Casey help each other heal their wounds? Will Ruth do the right thing for the contractors her company abandoned? The characters in Casualties are difficult to love. Before he enlists, Robbie is a directionless youth who blames his mother for all his problems. Ruth puts her job before her son, and sees the contractors who work for her company as little more than bodies. Casey is addicted to gambling. But they are tough, multi-dimensional, and the relationship between Ruth and Casey grows naturally. By the book’s end, the reader roots for both of them to be happy. Still, questions remain about blame and responsibility. Robbie is quick to point at his mother’s commitment to her hard-driving career and her expectations for his scholastic success for his brushes with drugs and the law. Did his experiences in Iraq lead to suicide, or was he already on that trajectory? Just how responsible is a parent for the bad choices of a child? When Robbie kills himself, Ruth is quick to blame herself and her commitment to her job as the reason for his actions. Casey, as well, has a “Robbie” in his past and a similar result for which he also blames himself. While Ruth’s company’s callousness toward its contractors make it an obvious villain, to me, Marro seemed to agree with Ruth’s conclusion that her desire to leave her New Hampshire hometown and be successful in her career were factors in Robbie’s downfall, a chilling subtext for women’s fiction. Structurally, I also found issues with the book. The first quarter alternates between Ruth and Robbie’s points of view, setting up the reader to believe that they are the book’s two main leads. Marro introduces a few characters in Robbie’s sections that seem like they will be important, only to lose them when Robbie’s point of view is silenced with his death. Granted, it’s very jarring and daring to kill off a point of view character. But when this happens at the twenty-five percent mark, it feels more like the writer was indulgent with her first act, rather than a deliberate attempt to shake up the reader. Similarly, Casey isn’t introduced until forty percent of the way through. A smoother book would have introduced both point of view characters in the first few chapters of the book, and Robbie would not have been one of them. These structural issues were more irritating than infuriating, however. 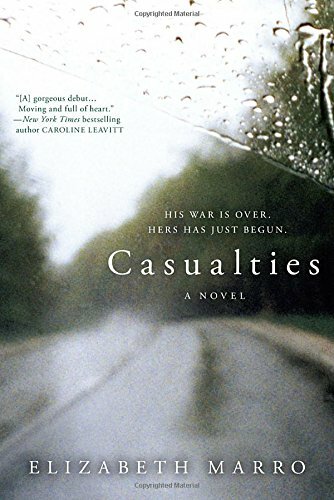 At its heart, Casualties is a moving story about two broken strangers who take to the road together and, during their journey, find a way to help each other heal. My biggest concern is that the book ends before the story does. Marro has left plenty of material for a sequel. Thoughtful review; this book sounds moving and timely. It is great to see some deversity in subject matter and tone; added this to my ever-expanding to-read list!